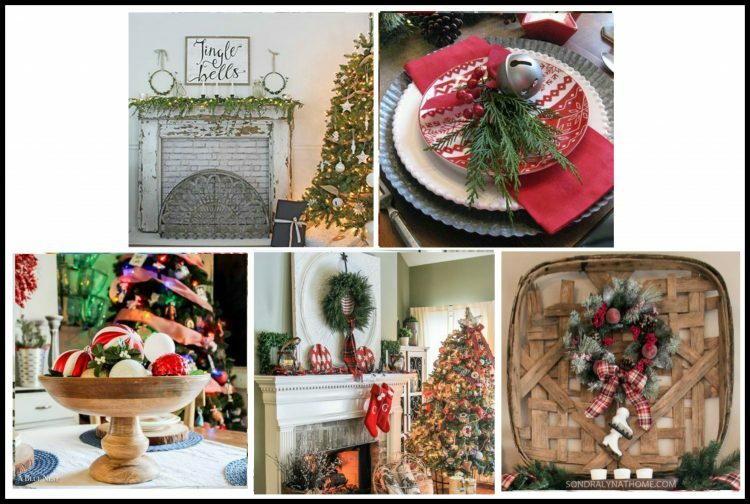 I am so excited to be participating with a wonderful group of blogger's today for a Christmas Home Tour. I would love for you to step into my cottage and have a nice slice of coffee cake and a lovely cup of coffee or tea. We are very casual here at the cottage but we hope you can feel the warmth and love as we welcome you here today. Barbara Garrett at The Everyday Home! 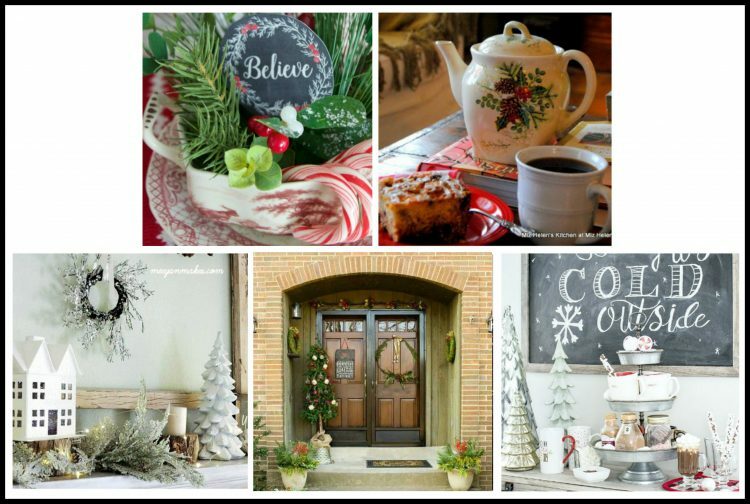 Welcome to the 'Tis the Season Blog Hop hosted by Barb Garrett and The Everyday Home. We may be a lot later getting our Christmas decor out than some others - but you know how the ole' saying goes. "It's Better Late Than Never." Please make sure you visit all of these amazing blogs for some last minute decorating ideas. One Of My Favorite Antique Wing Back Chairs Is Next To The Tree. You Can Remember Where You Sleep. We Love Our Screen Doors! Our Kids Grew Up Around This Table. It Was An Antique Farm Table That We Cut Down To Make A Coffee Table. Topped By A Christmas Tea Pot. Will Be Blooming Just In Time For Christmas Day. We Love Reading These Books Every Christmas Season. Look Who Is Here To Help Celebrate! Great Granddaughter Ella June Bug, Inspecting The Ornaments. The Best Part Of Christmas! This Is A Precious Christmas Platter That My Daughter Brenda Made One Year. We Shipped This Collection Home From Luxembourg When We Were There. On A Red and White Check Table Cloth That I made. I Love The Reflections In The Corner Tea Cabinet. Max Will Be Waiting For You On Christmas Morning! I am so excited that you love my screen doors, they are quiet a conversation piece here at the cottage. Thanks so much for stopping by today! Helen, your home is so warm and inviting. I'm a big fan of paperwhites and they will be so beautiful in bloom. That felt tree is adorable and I love all your handmade items and special collections. Let's not forget June Bug. The best part yet. I wish you and your family a very merry and blessed Christmas season. When the paperwhites bloom you can smell them all over the house, they are real special at Christmas. Thank you so much for your kind comment and for stopping by today! I really enjoyed this Christmas home tour Miz Helen! The numbered screen doors are wonderful! Your Christmas quilt is soooo special, what a treat to sleep in a bedroom decorated for Christmas! Love all the vintage crates, and your cute snowman collection~ very warm and cozy, you will be enjoying a very Merry season at your home! I am so glad that you liked my Christmas Quilt, it was quiet an undertaking and now a real treasure. Thanks so much for your kindness through the year and your ongoing support. Thanks so much for your kind comment and stopping by today. I am looking forward to visiting your home on Wednesday. It is fun participating in the tour with you. You are so kind, and I sure hope you will enjoy some of the recipes. It is so much fun sharing this blog tour with you and I look forward to visiting your home on Tuesday. Thanks so much for stopping by today and your kind comment. I so enjoyed my tour of your cozy cottage, Miz Helen. Your home is so warm and inviting...just like you, with so many special touches. Yes, I'd love a slice of your spicy cranberry coffee cake before I take up residence in your guest room with that beautiful quilt that you appliqued and quilted. Thanks for sharing your home with us! I am so excited that you could stop by the cottage today and take a look at my quilt. We need to go to one of our favorite tearooms and have lunch again soon. Thanks so much for stopping by today, I appreciate your support. 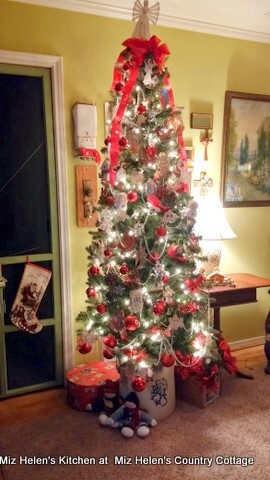 Your home is dressed perfectly for the Christmas, Helen! Looks like you had a lot of helpers and they're all smiles. To me that's the best part of the season and the best part of decorating!! Merry Christmas! Oh Helen. I just love your vintage pieces and style. Especially the Farmhouse coffee table. The idea that your children gathered around it melts my heart. 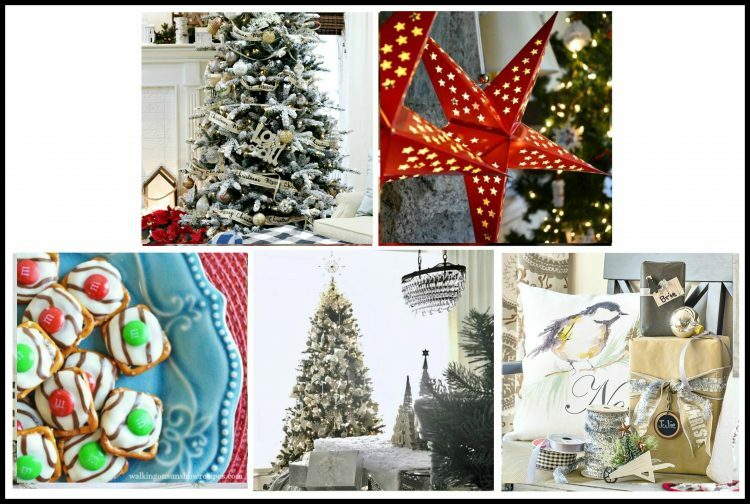 Your Christmas Decor is beautiful and perfect for family and friends to enjoy. Thanks for sharing your sentimental pieces and a piece of your heart. I love how you put your tree in a crock! And your great-granddaughter is just darling!! So happy to do this hop together!